We offer two options for the hardware at your point-of-sale. The pricing structure for the standard products is identical, allowing you to choose the best fit for your requirements. It is possible to mix and match the products across your site(s) if your scheme configuration allows. Our state-of-the-art tablet terminal with touch-screen and many advantages over traditional terminals. Available in 7" form with integral 3G for portability, or 10" form for greater viewing area and presentation usage. Slatepoint is recommended for most customers. The standard version of Slatepoint comes with a flip and swivel stand. With our Slatepoint solution, we are also able to offer 'Keyfob' type loyalty cards thus ensuring your customers never miss out on their rewards. 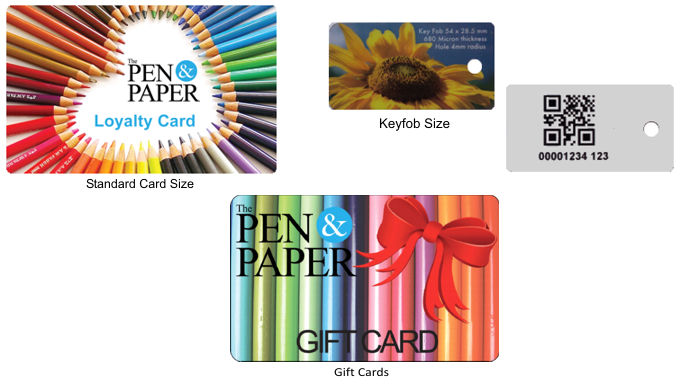 The Keyfobs can also be used in conjunction with standard loyalty cards. Slatepoint now includes Gift Card functionality either in conjunction with the loyalty scheme or as a standalone secure Gift Card system.